Jackson structured programming (JSP) is based on the fact that the program's structure depends on the structure of data, which need to be processed, so the data's structure can be used to form the program's structure. The JSP method is mostly using to the processing the data structure or the data flow, that can be viewed in a form of the hierarchical structure of sequential, optional and iterated elements. It is often used in developing a detailed program management structure base on a single set of basic constructions: simple operation, a sequence of operations, iteration, selection, etc. The following example of Jackson structured programming (JSP) diagram is created on the base of the Wikimedia Commons file. 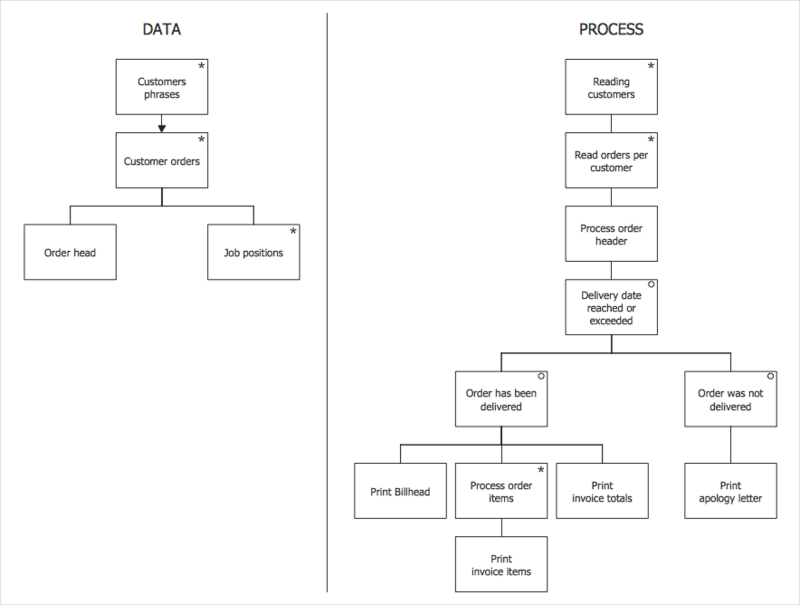 It includes two diagrams: Data diagram and Process diagram. The example was created using the vector library delivered with Jackson Structured Programming (JSP) Diagrams Solution. Reveal the Jackson Structured Programming (JSP) Diagrams in the Solutions panel. Open the JSP library. Select the objects and choose the connection tool. In our example, we used the Smart connector and both the Chain and Tree connection modes. Result: This example, created using ConceptDraw DIAGRAM, supported by Jackson Structured Programming (JSP) Diagrams Solution includes two JSP diagrams at once: Data diagram and Process diagram.